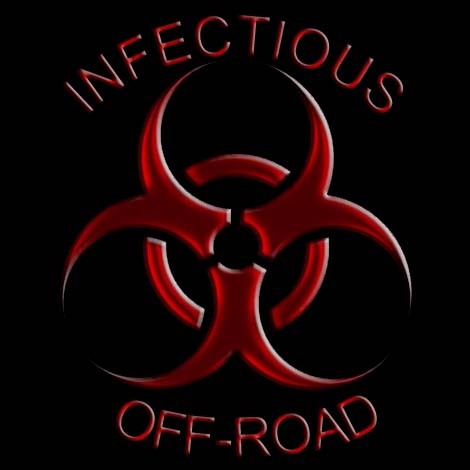 Welcome to Infectious Off-Road, we started this club based on the ‘Just Runs’ jeep club format that is prevalent in other parts of the world. We expect everyone participating to just be willing and interested in going off the beaten path, up on the rocks and pushing your limits, while being safe, not stupid. Also be willing to help others on the trail, you never know when you’ll be on the other end. It doesn’t matter what you drive, we are always happy to see new faces and explore new trails. We will also be planning weekend trips around the state and who knows where in the future, if you have suggestions, please post on the forum. We follow a tread lightly philosophy and remember to pack out what you packed in. The best way to get involved with our group is to create a login in the Forum and introduce yourself! 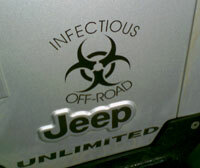 Let us know what you drive and where you are located! The sticker design has been finalized. 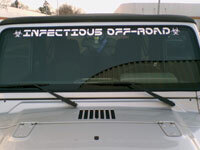 We have windshield decals, as well as ones for the doors (pictured right). They are avalable to anyone that would like to show there support! Log into the forum and let us know you are interested. We also have club T-shirts avalable! You can find pictures of them in the forum as well as ordering information. 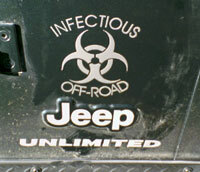 E-mail us if you would like us to add your Off-Road group to our link exchange. All we ask for in exchange is to add a link to our site on yours. Either the banner below or a written link will work.